Innovation you can expand on. 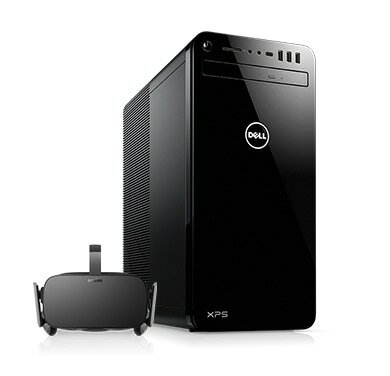 Our highest performing XPS ever with up to 9th gen processors, advanced VR-ready graphics and easy to expand chassis. Now fully configurable. Windows 10 Pro makes protecting and accessing your personal PC and important files easy, whether you’re at home or away. Safeguard sensitive material with encryption settings in BitLocker, and have the flexibility to share with specific recipients via USB. And never be without access to your PC through Remote Desktop -- placing your files at your fingertips, anywhere and anytime. Operating System recovery media is not included with this purchase. For a better and stronger Wi-Fi connection, upgrade to The Killer 1535 and its ExtremeRange technology. By including additional signal amplifiers, the 1535 is delivers a stronger connection and more data throughput at longer ranges than standard networking products. View Ltd HW Warranty here. Simplify repairs from drops, spills and surges with Dell Accidental Damage Service. Please note the coverage periods for selected Accidental Damage Service and Support Service must be the same. Accidental Damage Service Terms & Conditions here. Not sure if an Office subscription is right for you? By choosing Office 365, you will have the latest versions of Word, Excel, PowerPoint, OneNote and Outlook, plus 1TB of cloud storage. Choose between the subscription for 1 user (Office 365 Personal) or up to 5 users (Office 365 Home), and always have access to your documents from your mobile phone, tablet, PC or Mac. If subscription is not for you, all your favorite Office applications are also available as a one-time purchase to install on 1 PC only. Choose between Office Home & Business 2019 & Office Professional 2019 under Productivity Software below. Purchase a Dell PC and protect all your household devices with McAfee LiveSafe™ service. Easily protect and manage an unlimited number of computers, smartphones*, and tablets*. Seal sensitive data with facial and voice recognition with Secure Cloud Storage and easily access all your favorite websites with Password Manager. Registration required. For customers purchasing this digitally delivered software, a high-speed internet connection is recommended. Upgrade to 3-Year Subscription, $69.99. Limited time offer. CyberLink software makes it easy for you to create and play HD, 4K and 360 VR media with the World's No. 1 Movie & Media Player, PowerDVD. Unleash your creativity with the most powerful creative bundle including Award-Winning Video Editor- PowerDirector, and Creative Photo Editor-PhotoDirector. Foxit PhantomPDF is the feature-rich PDF editor, comparable to Adobe Acrobat, which allows users to create, edit, and sign PDF files. Easily import multiple file formats and merge into PDF files, or export PDFs to word, excel, PowerPoint, and more. It’s likely you’ve used Foxit, if you’ve used an Amazon Kindle or viewed a PDF in Google Chrome, Gmail, or Google Docs—Foxit technology powers these solutions behind the scenes. Limited Time Offer: Save $20! With Windows 10 Home – get the best combination of Windows features you know and new improvements you’ll love. Introducing Dell Cinema with incredible color, sound and streaming. CinemaColor: Visuals appear every bit as vibrant as the world around you. We've combined best-in-class panel technology with advanced hardware and software to power content with an enhanced dynamic range—delivering the deepest blacks, the most dazzling brights and more vivid detail across the entire color spectrum. Learn more. CinemaSound: Waves MaxxAudio® Pro boosts volume and clarifies every tone, so you experience studio-quality sound. Learn more. CinemaStream: Killer Wireless channels maximum bandwidth to your videos or music for a seamless, stutter-free experience. Learn more. Move at the speed of your ideas: With up to the latest 9th gen processors and high-performance graphics mean you get speed and power for video edits, video playback and gaming. More cores means increased performance while running multiple applications, making multitasking a breeze. The power to perform: Up to NVIDIA® GeForce® GTX™ 1080 graphics are available to power all your hardware-intensive tasks from photo and video editing to immersive gaming. Killer Ethernet : The Killer E2400 automatically detects and prioritizes network traffic, delivering incredible throughput while ensuring real-time apps have the lowest possible latency. This allows better video streaming, uninterrupted web browsing, faster downloads and smooth gameplay. The Killer Control Center also allows users to customize settings so their games, applications and website traffic perform exactly the way they want. For an even more powerful and VR-ready desktop experience, opt for the XPS Tower Special Edition. Built with advanced graphics, all XPS Tower Special Edition configurations are VR-capable so you can be the first to experience the latest in virtual reality technology. 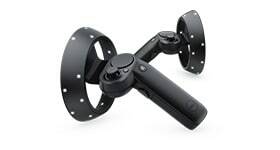 In addition, select configurations meet the recommended specifications to power an ideal VR experience with either the HTC Vive or Oculus Rift headsets. Designed to grow with you. Easy to access & upgrade: The optimized size of the tower required an innovative approach to maintaining tool-less access to the internal components. A swing-out power supply unit gives you easy access to the chassis, so you can expand and upgrade things like graphics and memory to meet your specific needs. 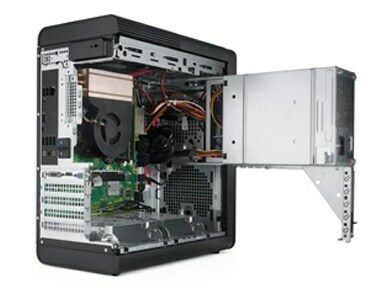 Endlessly expandable: Your tower can support up to 225W full size graphics cards and up to four storage devices. 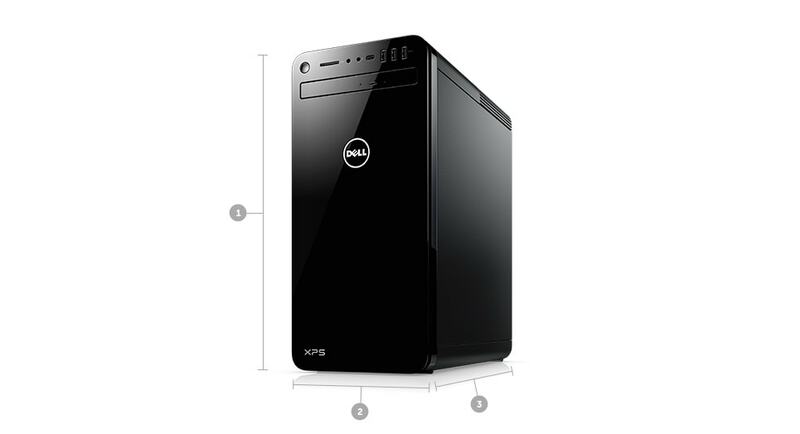 Enjoy plenty of storage with capacity for three 3.5" HDD bays or 2.5" NB drives plus one internal optical drive. Four tool-less PCle slots let you add in sound cards, graphics cards and more. Your command center: Connect all your devices in a snap with 11 total USB ports, including two USB Type-C ports – one now available in front – plus an additional three front-facing USB-A ports. Strong and silent: Even at full load, we’ve tested the tower to ensure that it stays as quiet as a whisper. With thermally controlled fans, the system is designed and built to meet Dell’s rigorous acoustic limits, so system noise is never a distraction. Keep your cool: An optimized airflow path uses side vents to draw cool air across graphics cards and CPU, while a separate airflow path cools the power supply unit. Rigorous, proprietary testing ensures that all system components are kept cool, even under the most intensive loads. 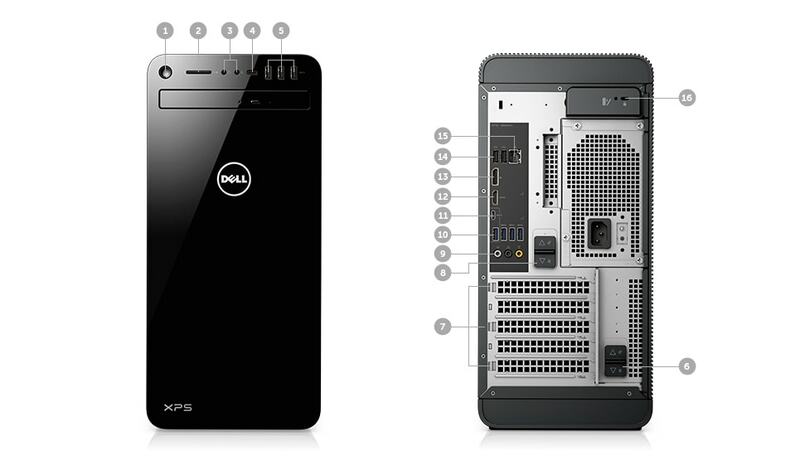 Award-winning audio: The XPS Tower is engineered for premium high fidelity sound quality and tested to ensure crackles and pops are eliminated. GRAMMY Award-winning Waves MaxxAudio® technology with MaxxSense adapts to the environment, making external speakers sound fuller, louder and clearer. Ports may vary depending on graphics card. 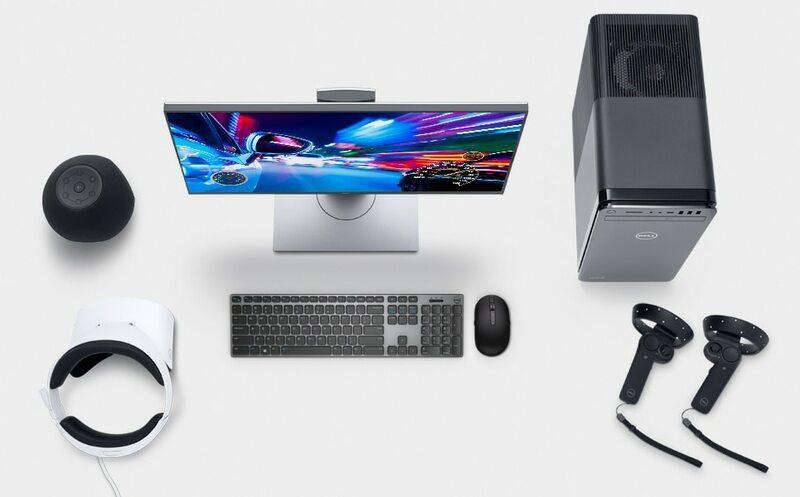 Complete your XPS Tower with a monitor designed to virtually float above your desk and a wireless keyboard and mouse for a clutter-free desktop. 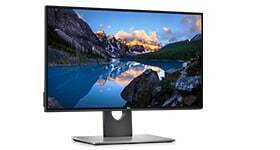 See the whole picture on a 25” screen that features an InfinityEdge virtually borderless display on all four sides with QHD resolution – nearly twice as crisp as Full HD displays. Experience premium performance in a cutting-edge wireless keyboard and mouse. Features wireless connectivity through Dell Universal Pairing for connecting up to six compatible RF devices or Bluetooth 4.0. Enjoy crisp, room-filling sound and a powerful subwoofer with enhanced bass, volume controls and a headphone jack in a stylish, contemporary design. 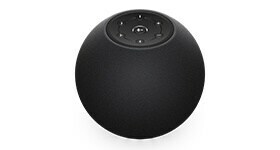 Fill the room with powerful, crystal clear sound with this 360 omnidirectional wireless speaker featuring premium design and enhanced wireless for streaming audio and video in sync. Experience virtual reality with a headset offering an immersive life-like visual experience with 1440 x 1440 high resolution per eye and fast 90Hz refresh rates for sharp, smooth images and a wraparound view. 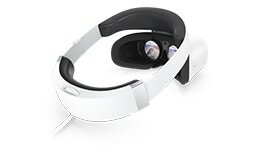 The comfortable flip-up visor lets you conveniently transition from the virtual world to the real world. Sink deeper into every virtual experience with the Dell Visor Controllers, featuring haptic feedback and 6 degrees of freedom for agile VR movements tracked through inside-out sensors in the Dell Visor. All of the support. None of the hassle. Dell’s ultimate support experience* from Premium Support Plus means new levels of performance from your PC . Automated system health scans and virus protection make your PC runs faster, cleaner, and more efficiently. Count on 24x7 help from Dell Premium Support. With experts at the ready, you can expect quick and easy issue resolution with less time on hold. Enjoy free shipping, easy returns, and price match guarantee.